The first stop of our trip was Seattle. That’s required when you leave Ketchikan. Alaska Airlines is the only carrier that flies from Ketchikan to the lower 48, and all flights stop in Seattle…sort of like all roads lead to Rome. In our case, it works out nicely since our daughter lives there, and it gives us an automatic opportunity to connect with her family. Well, ok, the star of the show is Riley, but that’s just the way it is…no offense to the adults in the world. Give me a two year old any day! 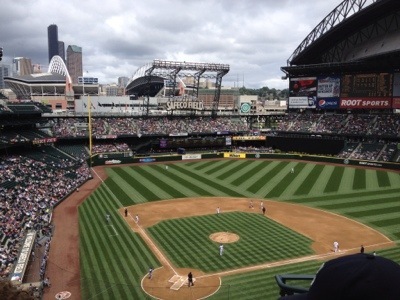 While we were there, we took in a ball game…Seattle Mariners vs the Texas Rangers, at Safeco Field. Guess who won? I hear the Mariners are having a bad year, and this game didn’t help. Didn’t score one run! Lucky for us we were there more for the ambience and experience. There’s just something about a baseball game on a nice summer afternoon…always makes me hungry for a brat! 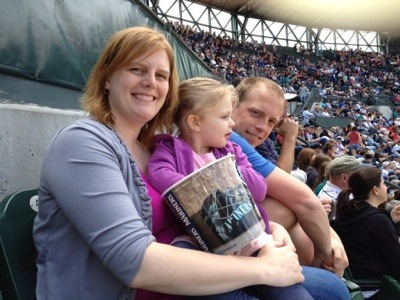 We haven’t gone to a professional game since we lived in Colorado, and occasionally made it to see the Rockies play. Weather cooperated, Riley cooperated, and we got to enjoy the whole show. Did the 7th inning stretch, got popcorn, chocolate dipped fruit, and ice cream, and enjoyed a little people watching. 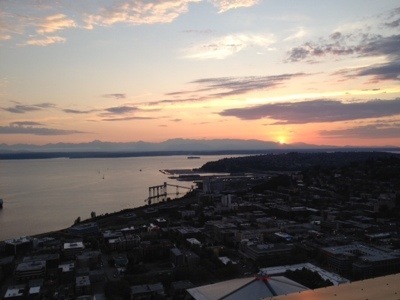 Our other big event was a trip to the Space Needle for dinner. 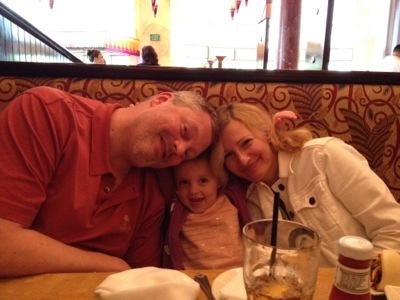 But this wasn’t just a dinnner…it was a 30th birthday celebration for our son-in-law, Matt, along with his parents. It was a perfect place for the celebration. 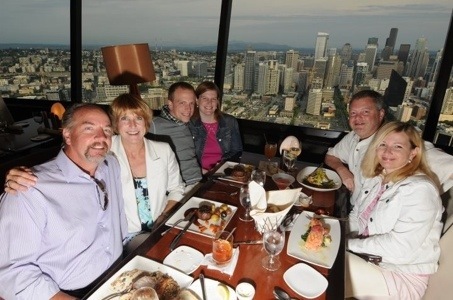 The views are amazing…the outer ring of the restaurant revolves, so you get a view of the city and the Puget Sound as you eat, and the mechanism is so smooth, you don’t even feel the movement. You just watch the views change. And the food was pretty good too. After dinner we went up to the observation deck and got a few more photos. 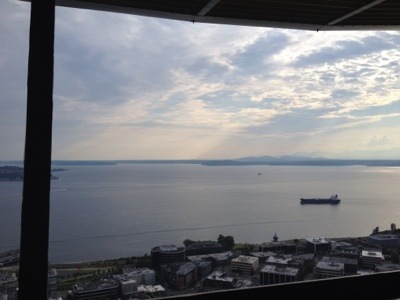 This is the 50th anniversary of the building of the Space Needle. 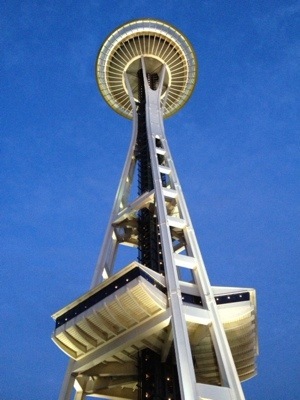 It was built in 1962 for the World’s Fair that was held that year in Seattle. It is the city’s iconic landmark, and it’s fun to experience the retro feel of the structure itself…sort of a step back in time/step into the future thing. Seattle is a fun place to visit, and I feel fortunate to have a connection there. I’ve learned that as a parent of adult children, where your children live, a piece of you lives. It’s not about owning a home there…it’s about a part of your heart belonging there. There’s only one thing that I don’t like, and that’s the traffic. I’m reminded that there is a price to pay for all the lovely attractions and shopping opportunities so conveniently clustered together. Thank goodness, we don’t have to drive when we visit. We’re along for the ride, and our daughter or son-in-law does the heavy lifting with regard to navigating the big city bustle. Well, on to the next! I love Seattle and I always forget about the traffic until I go there or someone reminds me 😉 Looks like you had such a wonderful time.